Chris Kavanagh, lives in the Poets’ Corner area of Hove. She works as a complimentary therapist, teaches in adult education, and is part of a holistic collective locally working in health promotion. Chris has had a connection with Poets’ Corner since her parents moved to the area in the ’60s. Chris has established and co-ordinates a joint allotment project, incorporating the Bright Exchange [www.brightexchange.org.uk], the Poets’ Corner Residents’ Society and the Hove Naturally Holistic Collective [www.theholisticpages.com]. “We took over the allotment eighteen months ago. It’s changed in nature over that time in terms the people that are involved in it. It started out primarily as a Bright [Exchange] project. In this last nine months it’s broadened out into the Poets’ Corner Residents’ Society as well, because we found that Bright members who live locally had a sustained involvement just because of the logistics of getting to the site. “Also in our local area we’ve formed a collective of holistic therapists and three members of that have become involved and we’d like to develop part of the allotment with that interest in mind, for example growing herbs. We were approached by a journalist from the Daily Mail, and she works on articles for the ‘Be Happy’ pages that appear on Fridays. She contacted us because she’d come across our project and she wanted to do something on a group of people working on an allotment. She made arrangements for a photographer to come up and then she interviewed us about the idea of the allotment, and the kind of people that were involved and what we were doing and that was quite nice, we got a double-page spread. “The Bright Exchange is part of a nationwide movement called Lets, and in different areas they’ve got different names for their Lets groups and our one is Bright. The Bright Exchange has been going locally for over twelve years, and it’s gone through different stages. The fundamental principles of Lets are continued on, which is to do with cashless trading. People think about their own skills or qualities or personality, or whatever things they may be able to offer others and then what they might need in return. “They exchange those services, time or goods not through monetary gain but through a different system – we call them brights. You have like a cheque book. If you do an hour’s work or support for someone else, it’s a standard quantity of six brights per hour. It could be child-minding, helping someone in their garden, move house, clear their clutter, repairing their bicycles, whatever. Every hour you spend would be six brights. A treasurer keeps an account showing people what they’ve earned and spent. One of the main things about it is the willingness to be helpful and supportive to each other, rather than exchange money. A number of members are on low incomes and it helps enormously. We’ve got people who’ve got jobs or income, but agree with the principles. “It’s a nice way of meeting a network of people that you probably wouldn’t otherwise meet. 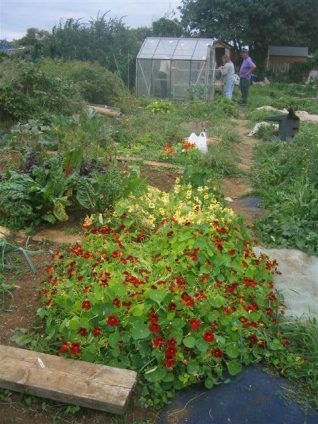 The allotment was just another thing that people can get involved with. They don’t have to use their brights. We thought this would be a nice way of Bright’s people working together. We might become very bountiful up there, so that might lead us into another area of Bright, with fresh, organic produce. And what is the Poets’ Corner residents’ involvement? “We have a summer festival every year here. We start off the festival the first or second weekend in July when we have a Family Fun Day at Stoneham Park. Thousands of people come for that. We have local bands, and local performers, and kid’s groups doing their dancing, magic tricks and stalls. A couple of years ago we started extending into a fringe fortnight, so now we have something happening every day around the area. From the last year’s summer festival, it was a food theme, and from that in the autumn we organised some ‘cooking on a budget’ courses. “We had a cook from Infinity Foods come to try and give us some ideas of how to use fresh produce from scratch to make different kinds of recipes that were both healthy and economical. From that we wanted to develop the idea of using whatever we could produce on the allotment, or encourage people to grow different vegetables themselves and include them at home. We’ve got a little cafe in our local park, so as part of the whole fringe event we had little recipes and we include some of the bits we grew on the allotment. “Then earlier this year we had a health and lifestyle afternoon in the local church hall, and we used quite a few bits and pieces that we’d grown on the allotment. We made dishes and things for people to taste. Everything we had there had at least one things from the allotment. We wanted to promote [people getting] involved in growing their own, growing food in collectives, and thinking about the food we’re eating and preparing for our children. “The whole allotment is organic. We want to try and use the allotment for herbs that we might use in treatment. One of our therapists uses flower essences quite a lot. She’s a homeopath. She is very keen on growing flowers and herbs that she can use for her own preparations. She’ll have more control about where they come from. How she works is she builds a relationship with her plants and flowers and gets a sense of them as well. We have somebody else who’s involved in Herbalism and she’s quite keen to develop the whole area of growing herbs in an organic environment. I myself do different kinds of massage and I work with the herbalist in terms of the idea of suspending herbs in oil and using them in massage, using things like: calendula; comfrey – this is very useful for anything to do with fractures or sprains; lemon balm – you can pick the leaves and use them in a tea – [likewise] mint. So what’s been happening on the joint plot? “The allotment is a standard-sized allotment. It was an unused site for many years. It was in an overgrown condition. We’ve spent time in trying to plan and design it a bit: we’ve put a temporary path down the middle; we’ve built a pond; and we’ve allocated little plots to people. 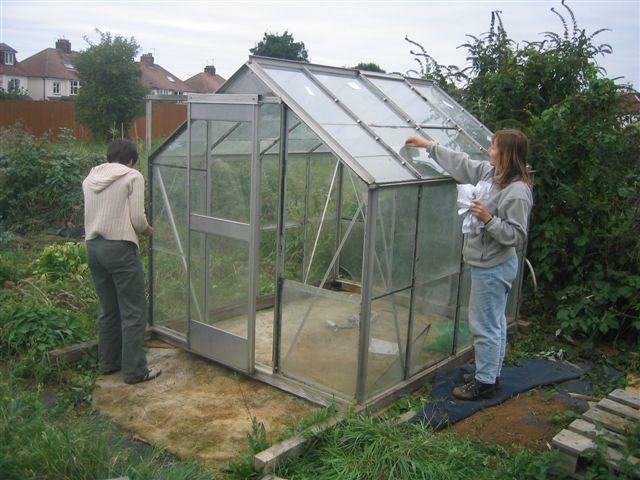 We’ve had a couple of sheds put up – one donated and one through funds – and a greenhouse donated. Most people who have gone up there are novices to allotmenteering, and so we’ve gone on quite a learning journey about planning out allotments and what to put in. We’ve become great scavengers. We’re very good at picking up things from skips and people’s front gardens – with their permission of course! We’ve helped people recycle their carpet. We’ve got two old baths that we’ve used as planters. People can take a plot, they can sort out what they want to do there, whatever they fancy trying to grow, and then we’ve got communal bits that we’ve done together. “It’s a very big undertaking to have an allotment, even if there’s a group of you it’s quite a job. At least when there is a group, you support each of other, and it gives more of a feeling like, it’s not completely impossible. It’s nice to feel you’ve got people working together on things. If you’re working, you’ve got a family, or you’ve got limited time anyway, it’s a solution because you’ve got a number of you who are all in a similar situation, where you can spare a few hours, rather than every day, that makes it more viable. If you are interested in joining this project, Bright Exchange members can contact Chris Kavanagh through the website; or Poets’ Corner residents can make contact via the Poets’ Corner Residents’ Society which is based in the Talk Shop in Stoneham Park. What has happened to this group. I see the the last entry was in the summer of 2006. Did I miss it but where is the plot? There are now loads of community plots all over the city and they seem to be flourishing so what has happened to Poets Corner? Editor’s note: This piece was written by one of our volunteers who interviewed the people concerned. I am sorry but we have no updates on the group.